MyKELVIN: Tomorrow: Catch the remarkable 1-hour special of The Amazing Race Philippines Season 1! 27000+ views already! Visit my personal blog: John Michael's Loving Me Loving You: JM's Blog you're going to Love. Tomorrow: Catch the remarkable 1-hour special of The Amazing Race Philippines Season 1! Dahil sa matinding support ninyo sa The Amazing Race Philippines, mas mahabang blog post ang maeexpect ninyo bukas ng gabi dahil 1-hour special na ang The Amazing Race Philippines dahil last 2 weeks na lang ay matatapos na ang karera. Kaya, pakatutukan ang mas mahaba at mga kapana-panabik na mga amazing race events sa 1-hour special ng The Amazing Race Philippines Season 1 na mapapanood bukas pagkatapos ng Talentadong Pinoy Worldwide. Pero, pakatutukan ang mga amazing race events sa Cebu mamayang gabi para sa Day 35 ng The Amazing Race Philippines na mapapanood naman mamaya pagkatapos ng Wil Time Big Time sa PRIMETIME PANALO ng TV5. Comments, suggestions and criticisms from the blog readers are welcome. All comments, suggestions and criticisms posted under each blog post will be considered property and reserved right to get the errors that were found on my blog posts such as grammar, typo errors, etc. Thank you for your valued patronage to this blog. As an appreciated support from you, my blog viewers for my blog which reached on its 8000th view, my blog will be having new widgets, new and lovely background that will come out soon. Continue to share the blog site to all people who can encounter some sites that is everything under the sun. 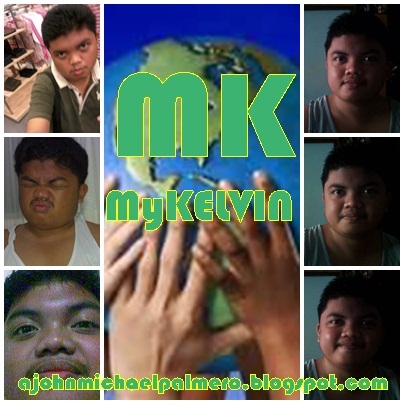 Watch out for a bigger and better MyKelvin blog. Version 2.0 is up! Click here. John Michael Angelo: Science Etc. I am a Member of iPanel PH. You should join too. I am a member of iPanel PH. You should too be a part of the team. Click here to register now. Note: Gmail accounts are allowed to make your registrations working. to your Website, Rush & Enroll Now! Do you believe that December 21, 2012 will be the end of the world? The Miss Philippines Earth 2013 celebrates Year of International Water Cooperation: Making A Splash! Mr. and Ms. Our Lady of Fatima University 2013 Text Voting: Open to all Smart and Talk 'n Text subscribers. Kapamilya Simbang Gabi: Schedules on the Run! (Blog created on November 1, 2012 at 3:50pm). Simple theme. Powered by Blogger.